Giving Some Lip to a Piece of Tongue – Eat Me. Drink Me. Having given up on the pig tails (for now, just for now), I took the train back home to Brooklyn and walked back into the carniceria on my corner. “I’m back,” I said, and the butcher, a young guy from Mexico, not much older than myself, shook his head at me. I told him I’d given up on the pig tails and would settle for something else – something fatty and a little tough so I could braise it. But I couldn’t find a cut of meat to suit. I didn’t want chops or ribs, much less feet or innards. I saw a bin with smooth, round organs, which would have fit perfectly in an open hand. The label was in Spanish and the only word I recognized was toro. Bull. I thought – no – it couldn’t be… And so I asked my new friend the butcher – we’d been chatting over cuts of meat and ways to prepare various dishes – “What are these?” He looked down and his voice lowered. “Testicles,” he said. “Are they… good?” I asked as I felt my face contort into an expression less than attractive. “Yeah, you know, you got to boil them, then slice them up and fry them with some peppers. Kind of chewy. But it makes you strong.” He grinned and made a muscle with his arm. It makes you strong. Of course it does. I almost, almost bought some bull testicles. But in the end, it didn’t quite fit with the broccoli rabe salad or the vegetables I wanted to roast. And then I caught sight of the tongue. Perfect, I thought – something weird, something sort of tough that I can braise into submission, something I’ve never made before. Tongue – what could be so hard about it? This was before the boot. This was before picking long, black cow hairs from taste buds, which looked so much like my own taste buds and felt so much like my own taste buds rubbed against the roof of my mouth. The experience was uncanny, as if I were preparing my own tongue for dinner, or at least some human tongue, bloated to three times its normal size. 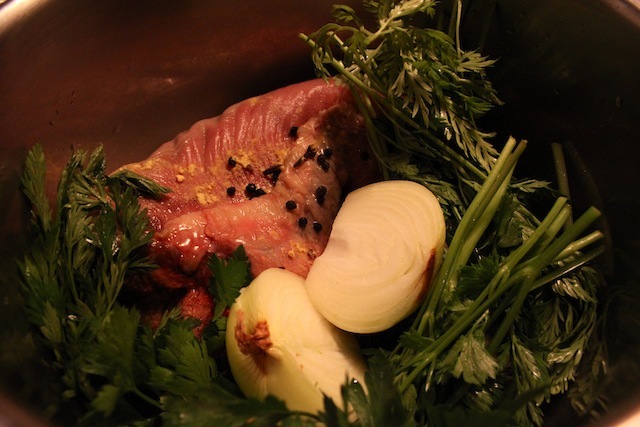 But I am an adventurous cook, and I’d just had ox tongue at St. John (though the texture of cooked taste buds is definitely a thing…), so I gamely washed my tongue and placed it in a pot with onions, carrot tops, peppercorns, cloves, and the Simon and Garfunkel quartet of herbs and set it to simmer. Fast forward three hours. The boot in my hand. I’d done some preliminary tongue prep research online, and the recipe I’d found said peeling the outer layer of tongue away was simple, like peeling a banana or slipping off a sock. I was confused, as I held my boomerang-shaped tongue, now condensed to half its original size. I ran a knife slit around the tough outer layer and tried to peel it off. It was stuck to the rest of the tongue tighter than a limpet to a rock. I made another knife slit. Nothing. I giggled a little out of nervousness. I still had about two hours of braising to do and a dinner guest arriving in half an hour and there was something desperately wrong with my tongue. I went back to the internet and googled “peeling a tongue” and sifted through some interesting hits. Among the medical mysteries and strange sexual fetishes, I found a few forums on cooking. Everyone said, oh, peeling a tongue is easy, like peeling a banana or slipping off a sock. I began to despair. What had I done wrong? How had I deserved this? And what would I feed my dinner guest? And then at the bottom of a Yahoo Answers page, someone else had written: “I boiled a tongue once. 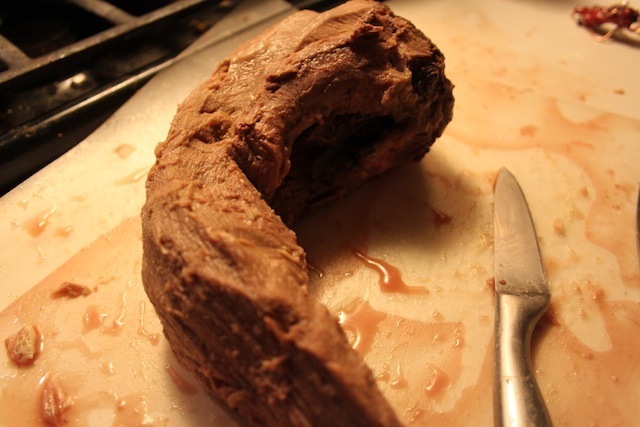 It was barely peelable even after boiling, and it looked like a little boot. Yeah, once.” I took comfort from this blurb. There was nothing to do but press on. I quickly cut it into harmless steaks. The doorbell rang. It had taken me forty-five minutes to peel the tongue and I opened the door still holding the knife and dripping tongue juice from my hands. I giggled nervously – again. “I’m about two hours behind and this might be… interesting,” I said. Giggle. So we sat at the kitchen table, drinking cooking wine, listening to Manu Chao, catching up, slowly growing hungrier. At hour one and a half, I decided to taste the tongue. 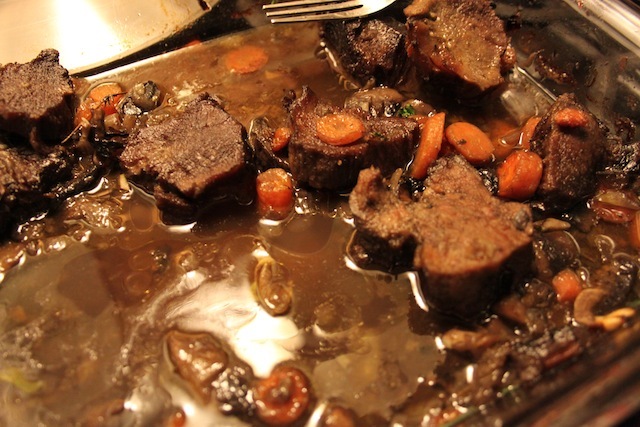 The braised meat was lovely – deep brown in hue, fragrant and earthy. The tongue itself was – chewy. A nice flavor, for sure. But chewy, definitely. I wondered if maybe I should have gone with the bull testicles. “It’s a little – chewy,” I said. I offered him a bite. “Yes, it’s a little chewy,” said my dinner guest. We poured the last two glasses of cooking wine. I pulled the broccoli rabe out of the fridge, figuring that that at least would be a safe bet and if the tongue turned out inedible, we could just eat broccoli rabe and bread. I whisked lemon juice and olive oil with garlic, salt, and pepper and tossed it with the washed and trimmed broccoli rabe. We slid two rolls in the toaster oven and sat down to hope the last half hour would work miracles with the tongue. The toaster dinged, the rabe had soaked, the oven was opened. 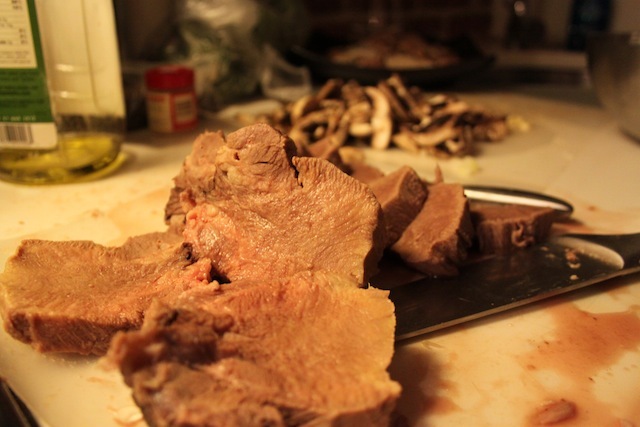 We served ourselves slices of tongue with giant heaps of broccoli rabe salad and hot rolls. And the tongue was – a little chewy – but the flavor was good, and cut into thin strips, splayed on a hot roll and topped with broccoli rabe, I was happy with it. Though I’m not sure I’d put myself through the experience again. Our meal saved, we made a lot of tongue jokes, and it ended up being a good night. If you liked the tongue, try it in tacos de lengua. They are delicious. The easiest way is to buy a few delicious slices at a Jewish deli. It will not be chewy, but more like slices of roast beef. 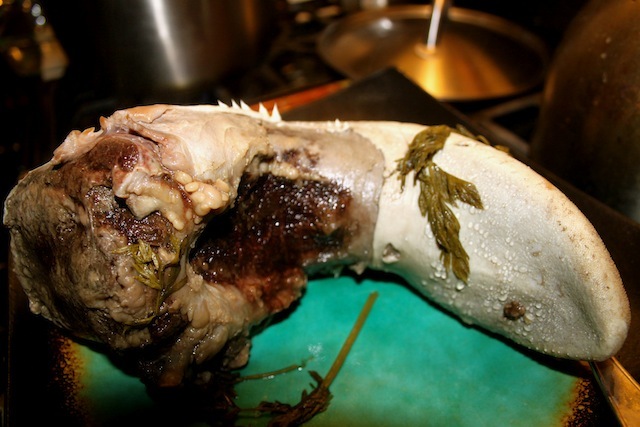 Having grown up eating tongue, we don’t think I mothers went through all of this! And now, I’m curious, and will get a tongue sandwich the next time we go to Too-Jay’s and give you a follow up report. MAYBE, you are supposed to peel it before cooking. You make it all sound like a major part in a Hitchcock movie, and I’m sure you could write a short horry/tonque in cheek amusing story about it. Although THIS might be the story. xo G’ma ps I’m sorry Mother isn’t alive to have read this classic cooking event.